You shall go to the ball… somehow! Saturday night was the Row St Kilda To Skye ball and ceilidh, an event to celebrate the charity efforts of a group of islanders who raised money for local causes via an epic 100 mile row. Liza and Barry had booked a whole table for the staff of the gallery and bakery and I was chuffed to have kindly been given a ticket. 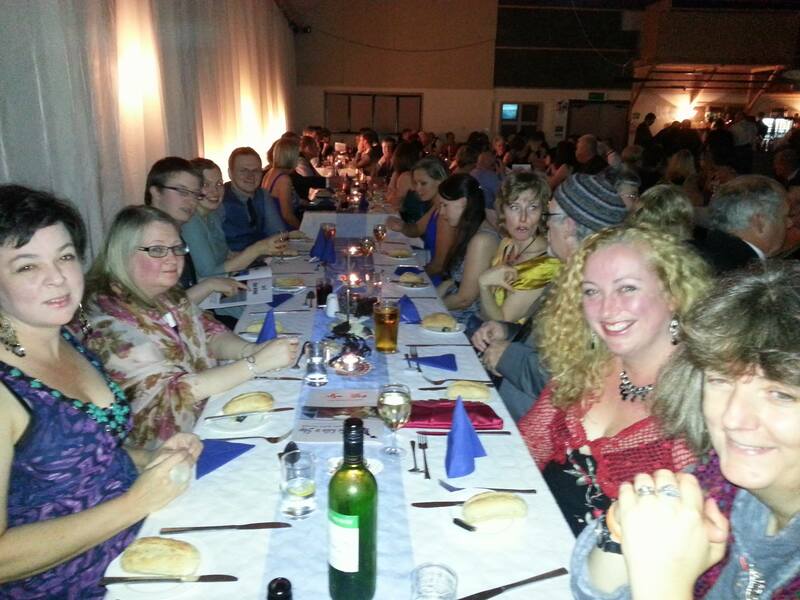 My first proper night out on Skye, it was a chance to dress up and to spend some social time with my new colleagues. The Row St Kilda to Skye superstar fundraisers. With thanks to them for this photo! It was a grey day so I’d ensconced myself in my B&B room for the afternoon with a book and continuous cups of tea. Of course, I forgot the time and all of a sudden it was time to get ready. Emma, my landlady at the B&B was staying elsewhere for the night and there were no other guests so I put on some music and started laying my outfit out. I always end up rushing to be ready for black tie things (I’ve got dressed in 5 mins in the back of a London cab SO many times), so I was going to take my time and enjoy this. To transform from scruffy girl in pyjamas with sleepy panda eyes I needed to grab my hair curlers from the car so I slid on some shoes and popped out. About 8 laps of the building and I’ve learned that Emma’s B&B is possibly the most secure place I’ve ever come across (not that I make a habit of trying to break into homes). The curtains in my room are open and I peer in at my phone, door keys, purse, evening dress etc etc on the bed. Everything just sitting there, mockingly. All I had were car keys. It was no use, I couldn’t get in. The last of the light faded away and I realised I only had 15 mins to get to the ball. Luckily I’ve got my entire life packed into the back of the Yaris and I ripped through my bags until I came across a long summer dress that could pass as eveningwear. A further rummage uncovered some shoes and a hair tie. I went to put my greasy, frizzy hair up but couldn’t see a thing. I’d have to drive to the square, park under a streetlight and get ready there. So that’s how I found myself stripping down to my pants in the pouring rain in the middle of a Portree car park. So, slightly frazzled and without ticket I rushed off to the ball. I followed the beautiful ladies and men resplendent in kilts to the entrance to the Portree community hall. It was beautifully decorated with creels, shells, pebbles and all kinds of coastal paraphernalia. Inside I joined the table and we had a lovely meal accompanied with live music from a local band. A film about the row followed and then the ceilidh begun. I’ve never really enjoyed country dancing myself but I loved watching everyone flinging themselves across the room to the sounds of traditional Scottish music. It was quite an appropriate introduction to the island, although I’m pleased it was more authentic than those tourists who go abroad and watch belly dancing or something to feel part of the culture! The Skyeworks gallery and bakery table. With thanks to the Skye Baking Company for the photo! 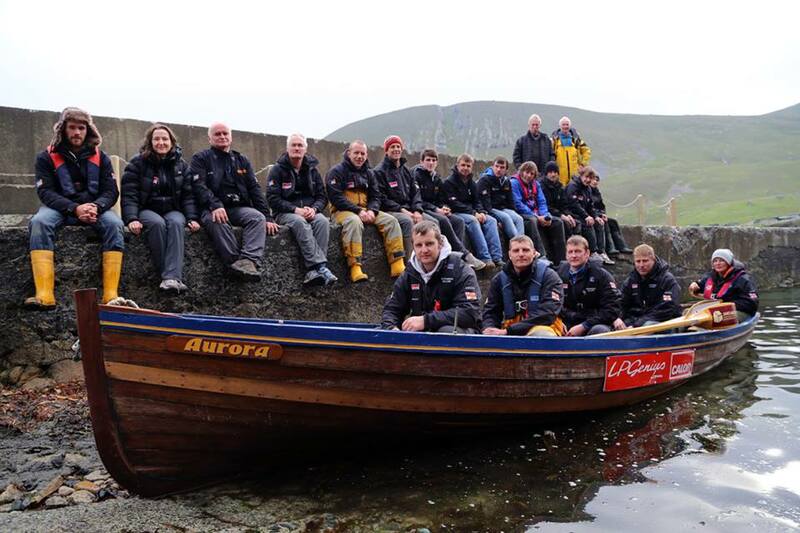 I found out today that, with the contributions from the ball, Row St Kilda To Skye have now raised over £39,000 for the RNLI and Skye & Lochalsh Young Carers. So they don’t just throw a good party, they’re pretty incredible fundraisers too! So, that’s how I went from standing in the rain in my pants to enjoying a rather lovely evening. As for getting back in? I’d resigned myself to a night in the car but I thought I’d post a note on the B&B door first to let Emma know the situation. By a blessed stroke of luck she’d changed her mind and decided to come home after all. I pushed through the door of my room and collapsed on the bed in bliss. Sometimes there’s no fairy godmother to get you ready for the ball; a princess has to be resourceful and independent and get herself to the ball. Actual moral of the story? Just keep a hold of your damn keys. This entry was tagged Ball, Ceilidh, Disaster, Fundraising, In a pickle, Locked out, Paint, Panic, Party, Portree, Reeling, Rowing, Skye, Skye Baking Company, Skyeworks, St Kilda to Skye. Bookmark the permalink.